GUARANTEED to be cheeky, bold and outrageous Jim Davidson is back on the road with a brand new tour, which comes to St David’s Hall next Monday (12 October). 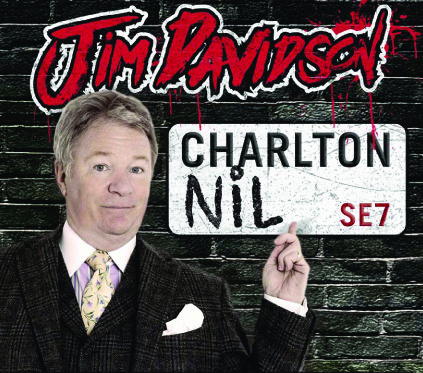 Widely renowned as one of Britain’s best loved and daring comedians, Jim Davidson OBE returns with Charlton Nil – a tongue-in-cheek homage to a lifetime of supporting his beloved football team Charlton Athletic. Jim first became a household name throughout the 70s as one of the UK’s leading comics before conquering Saturday night television in the 90s presenting his family friendly shows The Generation Game and Big Break. Plus, he won over a younger audience all over again as winner of last year’s Celebrity Big Brother series. Born to a Glaswegian father and raised in London, Jim’s done it all in his life from drummer to window cleaner to shelf stacker – but now he’s back onstage doing what he does best! Don’t miss the incomparable Jim Davidson live at St David’s Hall for one night only! Tickets are priced £22.50 (plus a £2.95 Ticket Service Charge per transaction and an optional 95p postage fee). £2 off standard concessions and one in 10 go free.